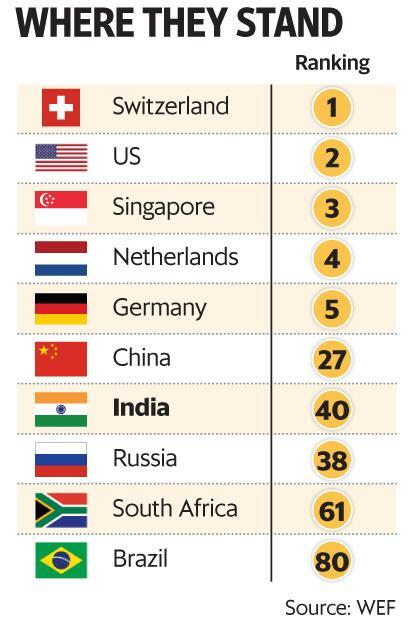 New Delhi: India remains the most competitive country in South Asia, appearing at No. 40 in the global competitiveness ranking of 137 countries by the World Economic Forum (WEF). The ranking is one lower than last year’s, but the two rankings are not comparable because of a change in the methodology, WEF said. The findings come at a time when India is looking to scale 40 spots to reach the 90th rank in 2017-18 in the World Bank’s ease of doing business survey this year. The report, however, cautioned against risks from uncertain global economic conditions. 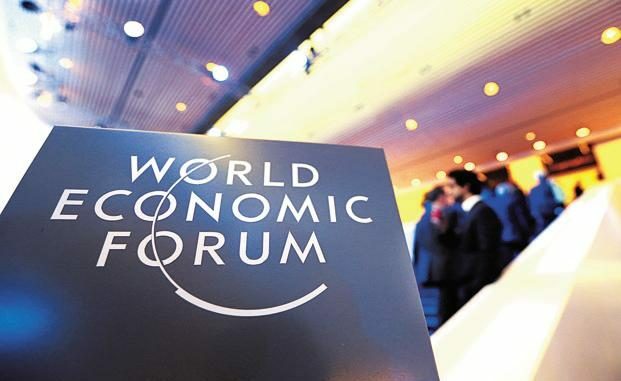 “Ten years on from the global financial crisis, the prospects for a sustained economic recovery remain at risk due to a widespread failure on the part of leaders and policymakers to put in place reforms necessary to underpin competitiveness,” WEF said in a statement. The report remained upbeat about India, which is planning massive funding to bankroll its new infrastructure programme. “India (40th) stabilizes this year after its big leap forward of the previous two years. 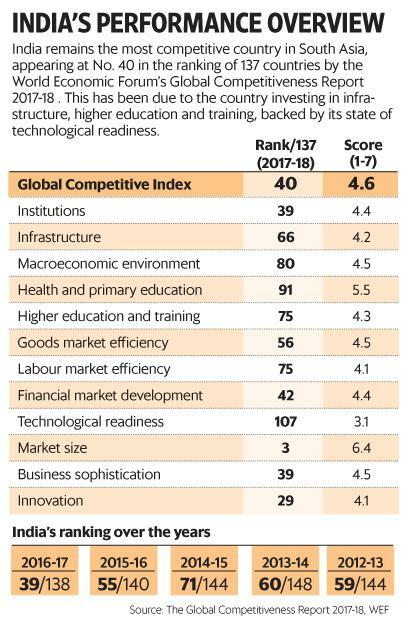 The score improves across most pillars of competitiveness, particularly infrastructure (66th, up by two), higher education and training (75th, up by six), and technological readiness (107th, up by three), reflecting recent public investments in these areas,” it said. The WEF lauded India’s efforts in the information and communications technology (ICT) sector. “Performance also improves in ICT indicators, particularly Internet bandwidth per user, mobile phone and broadband subscriptions, and Internet access in schools,” the report added. This in turn can provide a boost for the internet economy. While the total number of mobile internet users is expected to grow to almost 650 million by 2020, the number of users with high-speed internet access is expected to be around 550 million, according to The Boston Consulting Group. Data consumption is set to expand to around 7-10GB per month per user by 2020 from the current 700MB. However, concerns remain on doing business. “The private sector still considers corruption to be the most problematic factor for doing business in India,” the report said. “There is no doubt that there has been improvement in the business environment in India. However, much more needs to be done for the impact of policies to be felt on the ground,” said Sanjaya Baru, secretary general of the Federation of Indian Chambers of Commerce and Industry, a lobby group.